Cycling the French Way, the most popular route of the Camino de Santiago, is the perfect choice for those who love to travel by bike. If you choose to cycle the Camino de Santiago you will be able to complete the route in half the time; cycling is usually much faster than walking! This option is becoming more and more popular; in fact, almost 22.000 pilgrims obtained their Camino Certificate by bike in 2017. If you decide to cycle the Camino de Santiago, please note that you will need to complete at least the last 200 km of any of the Jacobean routes (and only 100 km if you prefer to walk). You can choose to start in Ponferrada and finish in Santiago, or complete the full French Way, from Roncesvalles to Santiago de Compostela. The first section, from St-Jean-Pied-de-Port to Roncesvalles, is not good for cycling. That is why our itinerary starts in Roncesvalles instead. 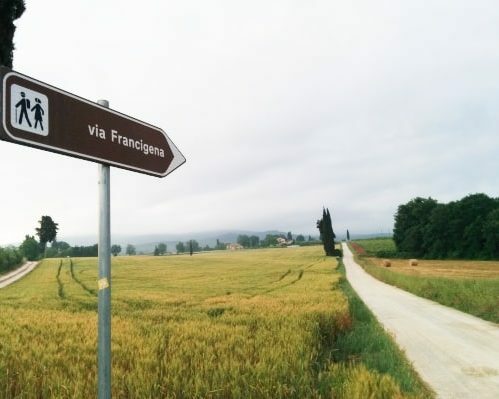 Another option chosen by many pilgrims who want to skip the section known as La Meseta, is walking from St-Jean-Pied-de-Port to Burgos; then cycling from Burgos to León (La Meseta) and continue walking from León to Santiago de Compostela. All our cycling tours on the Camino de Santiago include bike rental, helmet and saddlebag. But if you want to bring your own bike, that is no problem at all. This cycling tour is recommended to those pilgrims who have a previous experience with bikes. A minimum level of bike maintenance knowledge will be required, in case you have any issues on the way. Basic notions, such as changing a punctured tyre and essential reparations. If you have always dreamed about cycling the French Way of the Camino de Santiago, we will make things easy for your. Just jump into your bike, and let the adventure begin! Arrival in Roncesvalles. Although the full French Way starts in St-Jean-Pied-de-Port, the first section is not great for cyclers. That is why the cycling itinerary starts in Roncesvalles. The itinerary passes through beech and oak woods, and it crosses medieval bridges like the one called Los Bandidos. On the way to Pamplona you will be able to visit Zubiri, a picturesque village. The stretch finishes in Pamplona, a very popular city because of the Saint Fermin festivals. On the way to Estella we will face a challenging slope towards Alto del Perdón (there used to be a Pilgrim Hospital on the top, and there are still some remains of the building). You will be able to enjoy very nice views from there. On the way down to Puente de la Reina, you will cross the popular bridge over the Arga River (that was built for pilgrims). This cycling day is more relaxing compared to the previous ones. If you need to get back some energy, there is a fountain with wine on the way! This cycling day is full of churches and monuments. We recommend you to take a picture, in Santo Domingo de la Calzada, with the pilgrim monument. This is the longest cycling day of the tour. If you want, we can split it in two. If you still have some energy left, we strongly recommend you to visit the Cathedral, once in Burgos. This is a lighter cycling day, compared to the previous day. We recommend you to stop and visit the remains of the Convent of San Antón. Today you will cycle through the Meseta of Castilla region. There are many walkers who choose to cycle this part of the Camino de Santiago (and walk the other stretches), because the terrain is great for pedaling. Today you will continue cycling through La Meseta, where you will see crops and vast fields. The best part of the day: the arrival in León. León used to be the capital city during the Middle Ages, and it is an iconic stop for pilgrims on the French Way. We recommend you to visit the Gothic Cathedral and the Romanesque Basilica of San Isidor. You will lover to wander around the historical quarter! Before reaching Astorga, the Cross of Santo Toribio will be waiting for you. All pilgrims take a picture with this monument. Once in Astorga, you should visit the Cathedral and the Palacio Gaudí. That is why this stop is so popular among pilgrims! On this cycling day you will have to face the big ascent towards Cruz do Ferro. Once there, the tradition is taking one stone and throwing it to the cross and make a wish. After this big ascent, there a pleasant descent. One of the highlights of the day: Molinaseca. We leave Ponferrada behind, and we set out on the way to Galicia region. O Cebreiro is one of the most popular stops of the whole French Way. From there, you will be able to contemplate the mountains of Lugo and León. You will cycle through small hamlets and rural areas of Galicia, all the way from O Cebreiro to Santiago de Compostela. Once in Sarria, you may notice that the number of pilgrims increases. 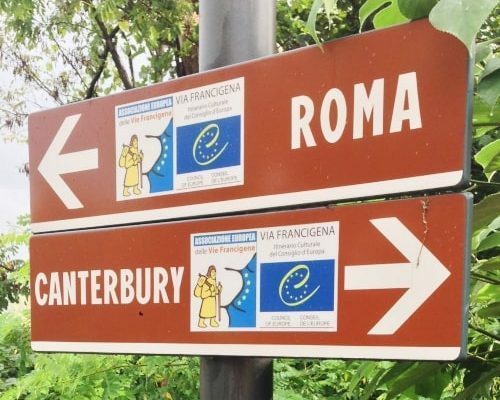 This is because the French Way is the most popular route of the whole Camino de Santiago, and Sarria is the starting point of the last 100 km of the route (the minimum required to get the Pilgrim Certificate if you are walking). One of the most popular stops of this cycling day is Portomarín. 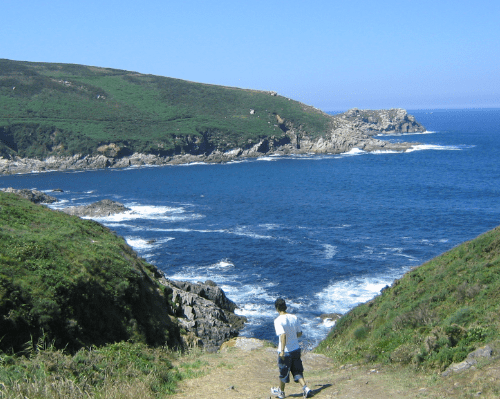 This small village of the Province of Lugo, has always been linked to the Camino de Santiago. The reservoir, the Roman Church, and the traditional liquors, are some of the things you must not miss! Last 50 km before reaching Santiago de Compsotela. Do not hesitate to try the local cheese once in Arzúa. When you arrive in Santiago, you can request your Pilgrim Certificate at the Pilgrim’s Office.